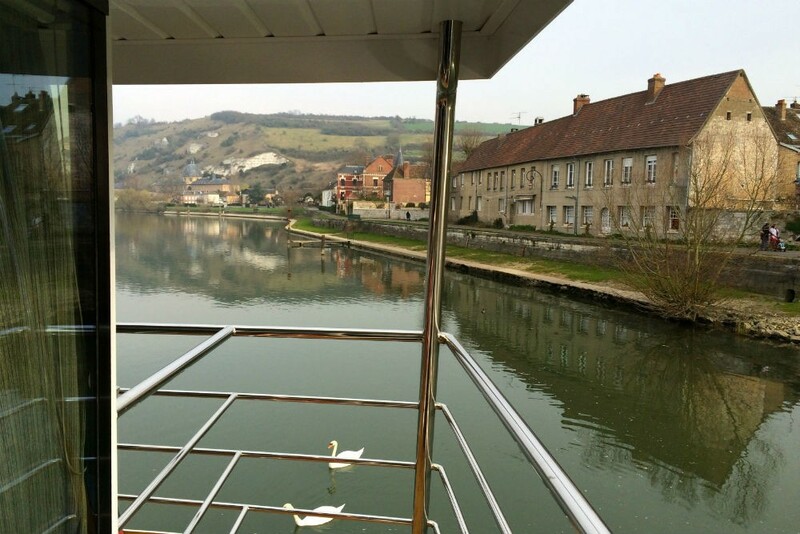 The town of Les Andelys, on the Seine in Normandy, as viewed from a back deck of Avalon Tapestry II. You’d probably assume a balcony is critical—for the view, the fresh air, the photo ops, the extra space, the privacy. A balcony is a big plus at a resort and on a huge ocean ship, but on river boats it can actually be a drawback: River ships have a width limit (so that they can fit through locks), which means that cabins can only be so wide, which in turn means that a balcony takes away from your interior room space. If it’s chilly or raining—as it sometimes is—you’ll value the interior room space more than the balcony. Also, a balcony lets you see only one side of a river, whereas elsewhere on the ship you can see both sides at once. And who wants to miss half a river? 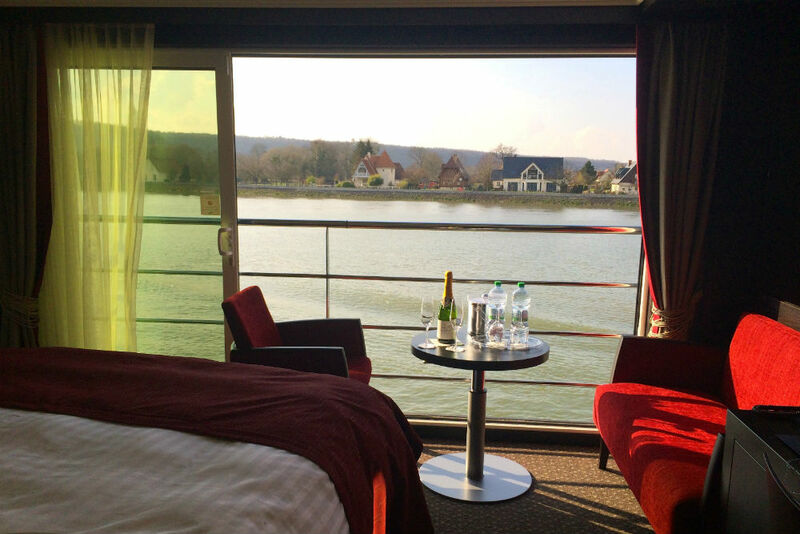 This is why many savvy river cruisers opt for a “French balcony” instead of an “outside balcony.” A French balcony is a glass door or wall-to-wall window (here’s an example) that opens to give you fresh air and the feel of a veranda, minus the outside floor, tables, and chairs. 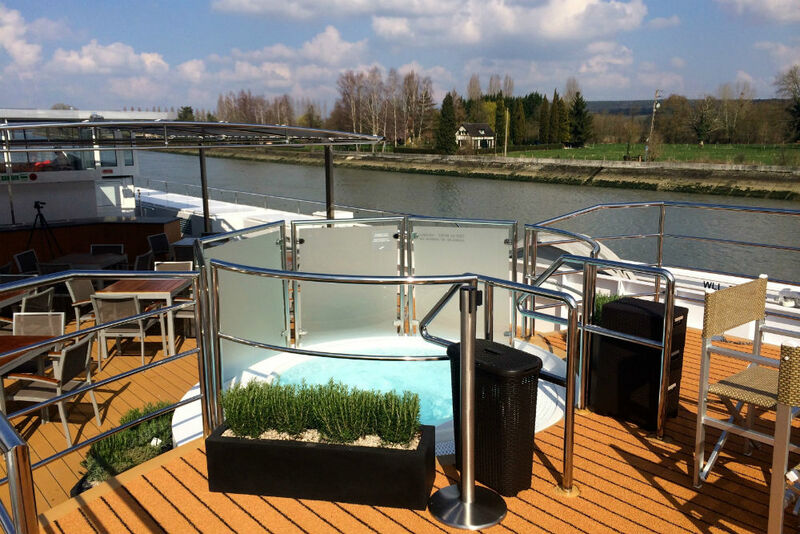 The best such pseudo-balcony I’ve seen is on Avalon Waterways’ newer ships. The outside wall of the cabin is floor-to-ceiling glass that stretches 11 feet wide and slides open 7 feet wide. Basically, it turns your whole room into a veranda. Avalon calls these cabins “Panorama Suites.” Technically, they’re not actually suites: Each is one room that measures 200 square feet and has a comfy sitting area (a chair, a loveseat, and a table) overlooking the water. The bed faces the view—a bed position that is unusual for river ships and is a nice touch, as the view is the first thing you see when you wake in the morning (unless you’ve drawn the curtains, you’re in a lock, or another ship is parked alongside you—which is a reason why most people do draw their curtains at night). With cabins that transform into open-air terraces, who needs a balcony? Looking out my window from the other side of the bed. If I’d opted to go with everyone on the bus, I would have missed riverscape like this. 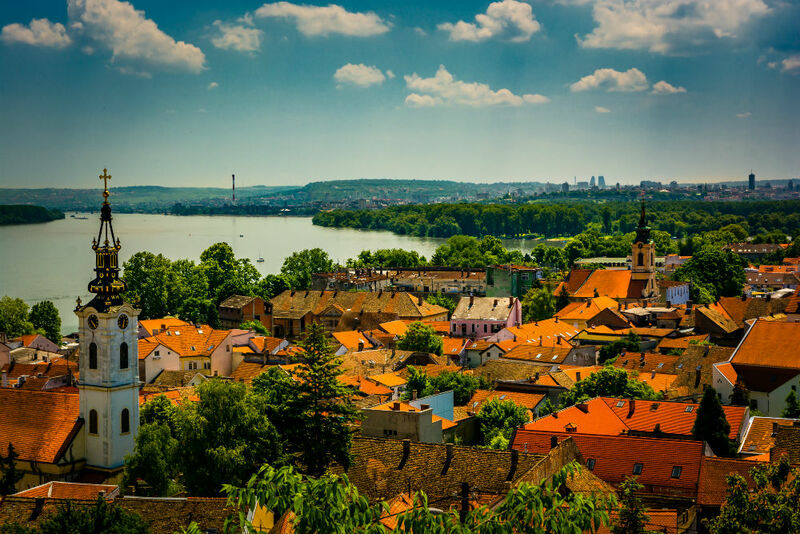 So find out whether the cruise line and itinerary you’re considering may force you to choose between the river itself and the sights away from it—and whether those stretches of river are not-to-be-missed picturesque or okay-to-miss industrial. A good cruise director will answer these questions honestly and accurately, and Google Earth can help too. If the cruise director can’t tell you which stretches of the river are most interesting, do what I do—even though technically it’s not allowed: Knock on the wheelhouse door, befriend the captain, and ask him (at a moment when he’s not busy steering around barges or into locks). Captains always know. Don’t bother spending precious time attempting to find out where your ship will dock in each town. We choose hotels for their location, of course—so it’s understandable that you’d want to know where a ship will be situated—but, for the most part, they all dock in the same spot. Some ships might have better real estate in certain cities. In Budapest, for instance, Viking’s spot is right under the Chain Bridge. As a general rule, though, all the ships park in pretty much the same area—and, to some degree, where they park can’t be known far ahead anyway. In Passau aboard Viking, we docked in one spot and then later the ship moved several slips downriver. I want these in a hotel or on a giant cruise ship as much as the next person, but the fact is, on river ships, you rarely see anyone in the gym (which is tiny and only minimally equipped) or the pool (which is equally tiny except on some Uniworld ships that have gorgeous indoor pools and some AmaWaterways ships that have a relatively spacious pool with a swim-up bar). 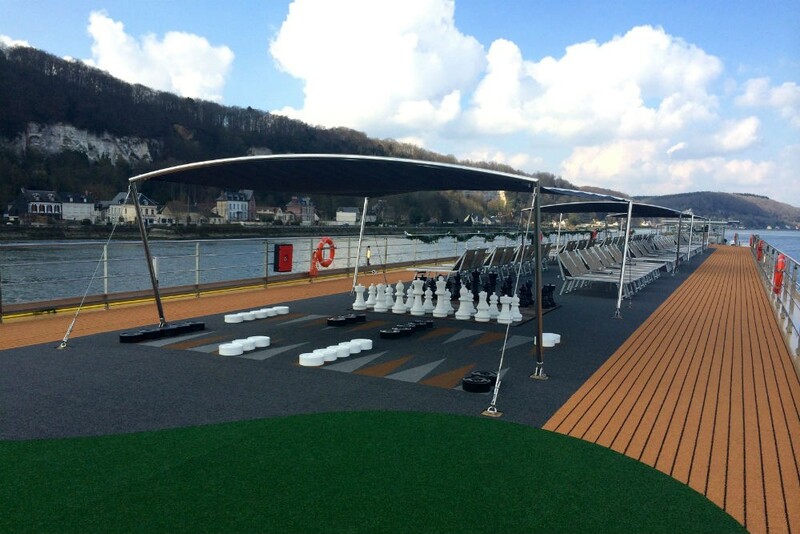 There just isn’t enough time to use the gym or pool, as you’re off the ship exploring all day. And if you’re not off the ship, chances are either it’s night time or you’re gliding down a significant stretch of river that you won’t want to miss. 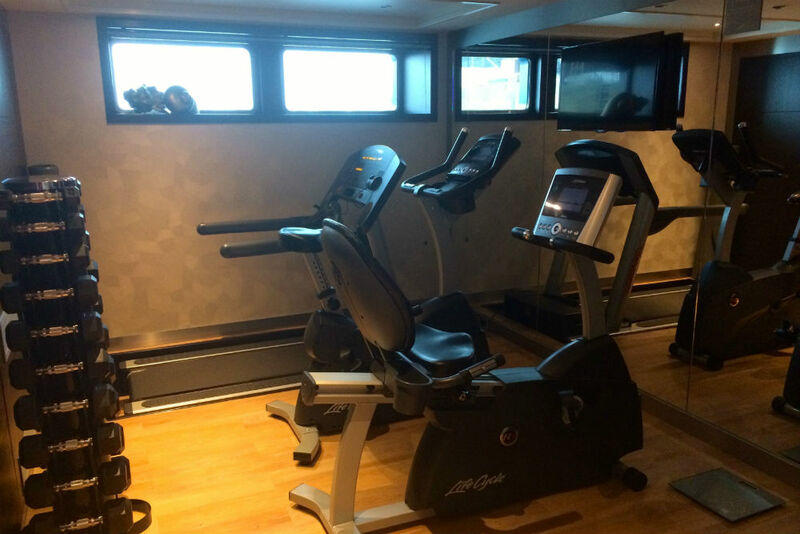 Cruise-line execs keep gyms and pools on ships as marketing tools to get travelers to choose their ship, but the reality is that you likely won’t end up using either. The ship has a hot tub, although I never saw anyone use that either. Most people I know, when choosing a hotel or an oceangoing cruise ship, veer away from anything too huge. But on Europe’s rivers there are only two sizes of cruise ship: 110-meter vessels (which hold about 128 passengers each) and 135-meter vessels (which hold about 166 passengers each). Viking’s longships squeeze 190 passengers onto a 135-meter ship, which competing cruise lines say make it feel crowded. Honestly, though, I sailed on a 190-passenger Viking ship and, other than chairs spaced close together in the observation lounge and trouble finding seats for my party of four at dinner one night, the ship didn’t feel crowded to me. (Then again, I grew up in Manhattan, so my definition of “crowded” may differ from yours.) 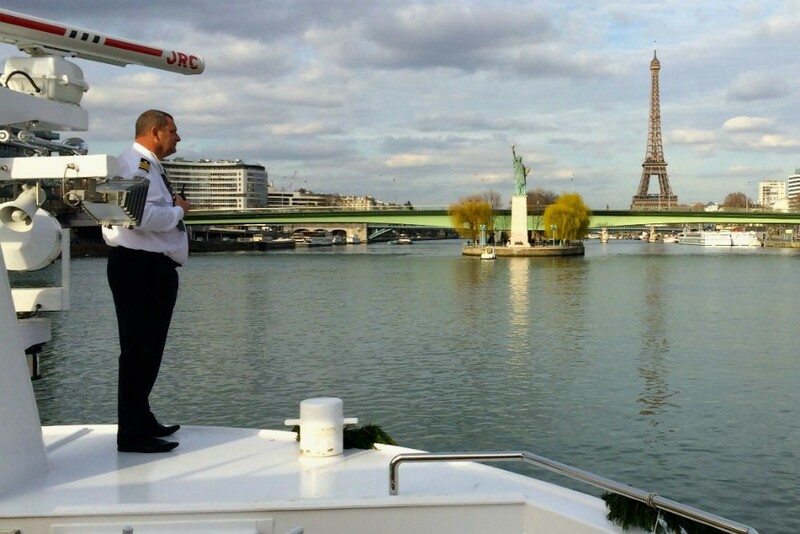 Nor did I experience less personal service on Viking, partly because Viking (unlike other river cruise lines) has a dedicated concierge who provides such service. If I were you, instead of choosing among river ships based on the number of passengers, I’d choose based on factors that I think will affect your trip more—namely, itinerary, river landscape, cabin type, and like-minded fellow passengers. In a hotel it can make sense: Choose the lowest-category room at a fabulous property, so you can take advantage of everything the hotel offers, and use the room just for sleeping. On a river cruise, though, the least expensive cabin can be really tight—170 square feet or less—with small windows that don’t open. It’s usually worth the several hundred dollars more to get a French balcony. The aforementioned Avalon “Panorama Suite” cabins cost about $100 more per person per day than the ship’s lowest-category rooms. They’re worth it. In a hotel or on a megaship, it’s easy to stick to yourselves, but on a river ship, there’s a lot of forced socializing. Every night there’s a four-course (at least), two-hour (at least) dinner where you’re seated at tables with other passengers, some of whom you just met. I’ve made some great friends at these chance meetings, but I’ve also been stuck with some louts. Viking is the only river line I know that provides an alternative venue where you can grab a half-hour dinner on your own if you just don’t feel like making chit-chat with strangers. It’s not clear to me why you’d ever need a room-service breakfast, though, given that on many ships food is available in the observation lounge—which is no more than a 30-second walk from your cabin on these small ships—starting at about 6 a.m.
“Early risers’ breakfast,” in Avalon Tapestry II’s observation lounge, precedes the regular breakfast buffet in the dining room. 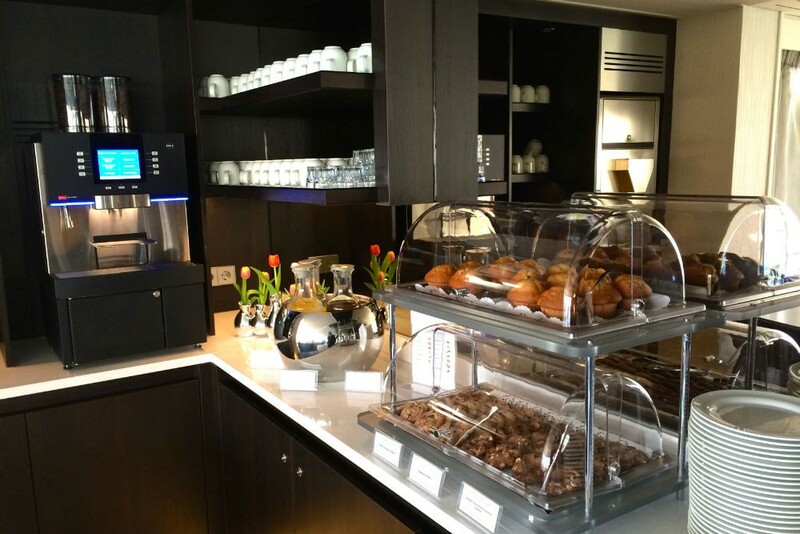 Attention, caffeine addicts: Don’t expect to find an in-room coffee machine in most river-ship cabins. You really don’t need one, though: Every vessel I’ve sailed on has a fancy coffee machine mid-ship (either off the lobby or in the observation lounge) that whips up espressos, cappuccinos, and machiattos, plus there’s hot chocolate, an assortment of teas, and snacks such as cookies and fruit. And that coffee machine is never more than a 30-second walk from your cabin. In fact, on the Avalon Tapestry II, there are two such coffee set-ups—one in the front lounge, one in the back lounge. Which means coffee is never more than 15 seconds away. The coffee machine in the back observation lounge of Avalon Tapestry II is one of two coffee-and-tea set-ups aboard the ship. 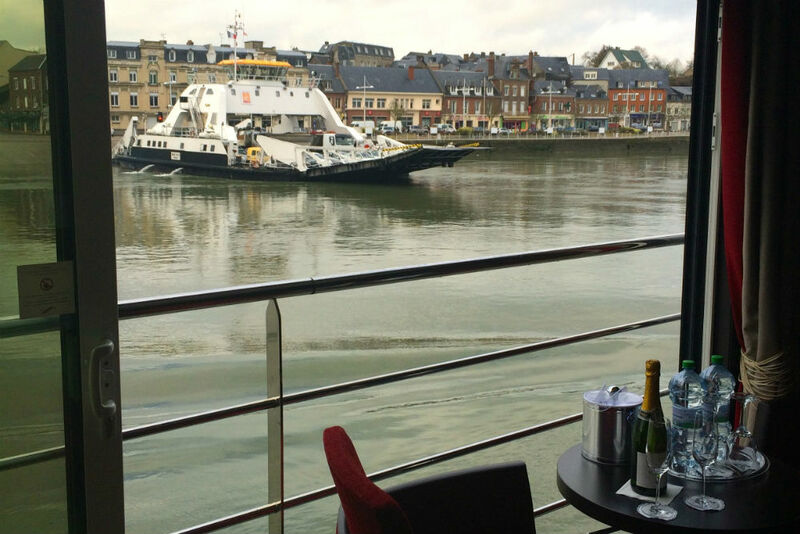 The good news: The Wi-Fi on river ships is free. The bad news: It comes and goes, depending on whether you’re in a lock or on a remote stretch of the river or the other passengers are sucking up all the bandwidth. Where you’ll have Wi-Fi and where you won’t is unpredictable—and none of the river lines are better or worse at providing it—so just know that, generally speaking, your best windows of connectivity are when you’re not in a lock and other passengers are off the ship or have gone to sleep. Know that coffee shops in towns along the way offer better and free Wi-Fi. Also know that nobody requires more frequent Wi-Fi than I do, and a river ship is actually one of the best working environments I know: You can sit at your laptop for hours yet have an ever-changing view. 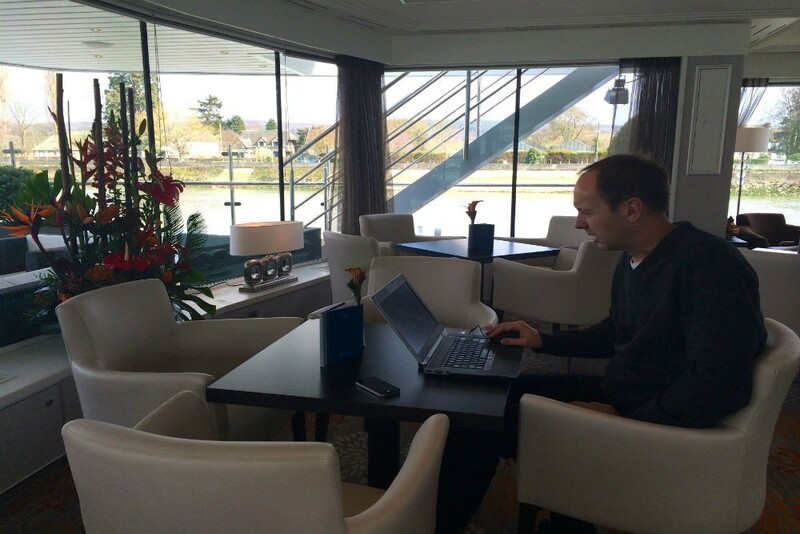 As an example, here’s a fellow passenger at work in the observation lounge aboard Avalon Tapestry II. It’s Gene Sloan, who writes Cruise Log for USA Today—and here’s what Gene had to say about Avalon’s panorama-view cabins. Fellow passenger Gene Sloan at work in the front observation lounge. Thinking of adding a 2 night stay in Vienna to a 7 day river cruise on Danube. Would it be better to just do a longer cruise or is the “land” stay worth the disembarking and going on our own? How much time will we actually have with a “2 day” land tour. Sonja, river-ship cabins are for two people each. If you have a party of three, you may need to book two cabins. On some sailings, some cruise lines will charge you the price for four people, even though you’ve got only three people. On other sailings, a cruise line might charge a “single supplement” to a solo traveler who is occupying a cabin for two: that might mean paying 150% of the per-person cruise fare. On certain sailings, some cruise lines waive that single supplement. 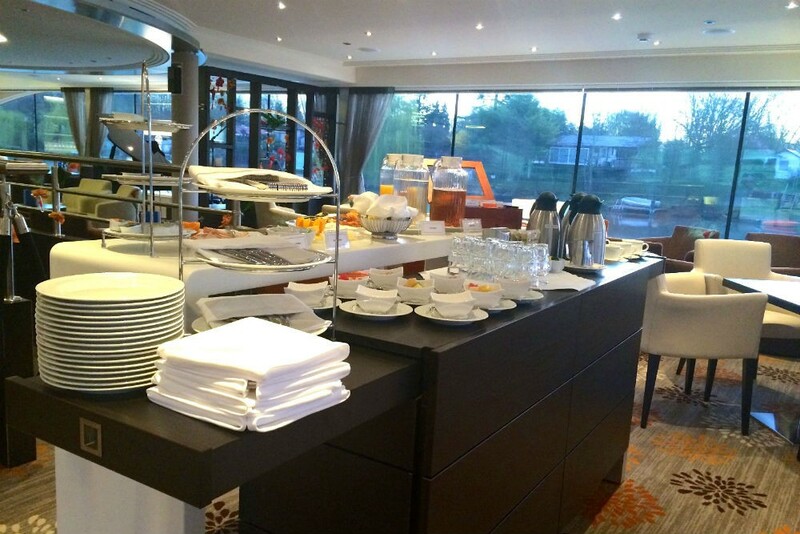 If you click to Ask Wendy (click on https://www.wendyperrin.com/ask-wendy-question/ ) and answer the questions there, I can recommend a river-cruise trip-planning specialist who can pinpoint for you which specific cruise lines and sailings will deliver the best value to a three-person group. Great advice, especially about the French Balcony vs. a true balcony. Hoping to take my first river cruise in 2019. I’m just beginning to research European river cruising, and came upon your very informative site – thanks for posting this useful information! I’m a bit confused, though, on what you wrote about river boats all fitting the same size parameters (110 & 135 meters). I’ve been looking at some of the river boats featured on the “Barge Lady Cruises” travel site, and all of them are much smaller, holding 8 – 20 guests. What am I missing? What an awe-inspiring and highly informative article. Thanks for giving us the straight dope. from Nuremberg to Budapest. we have or are going to book a veranda suite A on long ship ALTA.. Has anyone done this cruise before, any advise or comments? 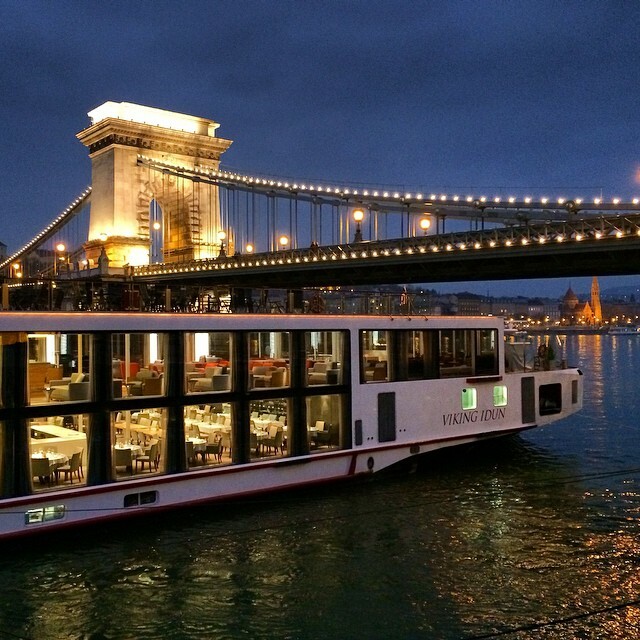 Is a river cruise suitable for passengers who are unsteady on there feet, are the cabins quite @ night when on the move. I’ve never been on a river cruise, so want to have a “good cabin” on a good deck. There are two of us travelling together & we are in our 80’s. 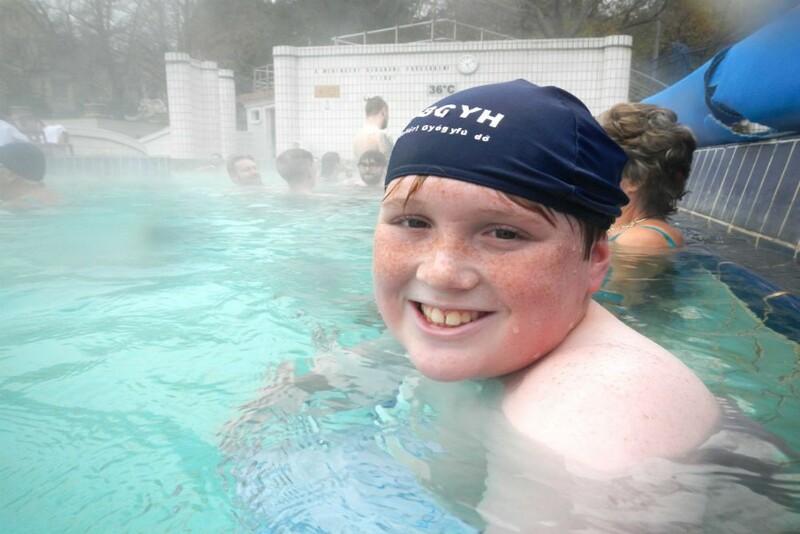 We had thought of the Rhine, can you suggest which company to use? A passenger on river cruises feels very little motion; there is certainly no rocking back and forth. And, yes, the cabins are quiet at night. 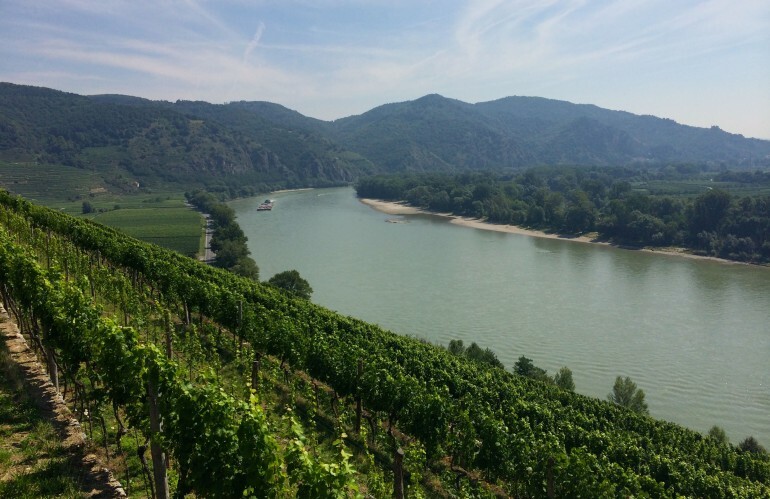 But I need a lot more information about your trip goals and interests and needs in order to recommend the right Rhine river experience for you. I suggest that you read Which River Ship Should You Choose? Here Are the Key Differences. I also suggest that you reach out to river cruise specialist Tom Baker for savvy river-cruise guidance and to book your trip; use this trip request form so that he knows that Wendy sent you and you get VIP treatment and my trip monitoring. Hi Wendy, Your article “Planning a River Cruise: 7 Mistakes You Think You’re Too Smart to Make” was great! Can you answer one more question about sleeping on long ships? My husband has been on a long ship and did not have any seasickness as it was a quiet ride. How is sleeping at night on the ships? Is there a lot of rocking? Susan, there’s usually no rocking. I don’t recall ever feeling any rocking motion when sleeping on a river ship. You may go through locks at night–which means the ship will move up and down–but the movement isn’t very noticeable. You might wake up with your ship smack alongside another ship (it’s common for two or three ships to “raft” together at docks), in which case you might open your window curtain in the morning and be staring into someone’s cabin on another ship. But rocking? That’s not a problem. I have enjoyed reading all of your travel advice on your new site. Thanks! done some research on the barges. I wondered if booking the entire barge would be right for our family rather than a typical river cruise. We enjoy good food, wine, travel and much needed time together. However, we do enjoy some luxuries as well. Any suggestions?